Nationwide, as in Questa, traditional rural economies tied to natural resources like farming and mining are experiencing longterm declines. Jobs in the U.S. mining and timber industries have decreased since 1939; mechanization has cut the number of farming jobs from 40 percent of all employment in 1900 to 2 percent today. Those jobs are not being replaced by knowledge-based industries like health care, real estate or technology, which are growing faster in cities than in rural places. 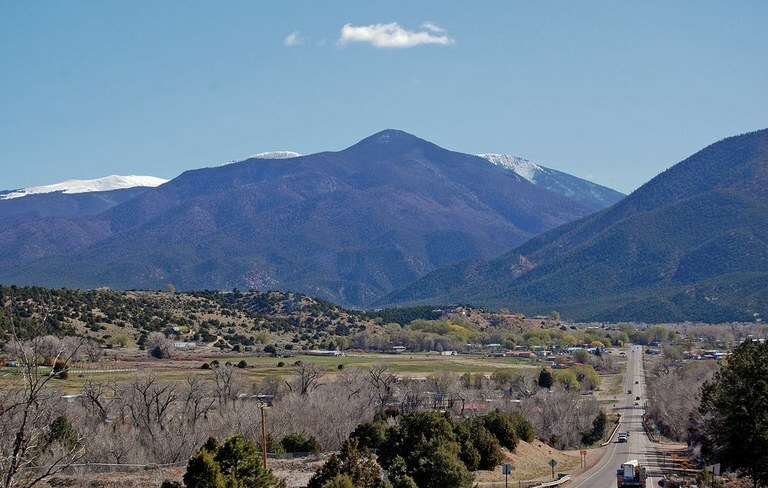 The own of Questa is transitioning from a natural-resource economy. 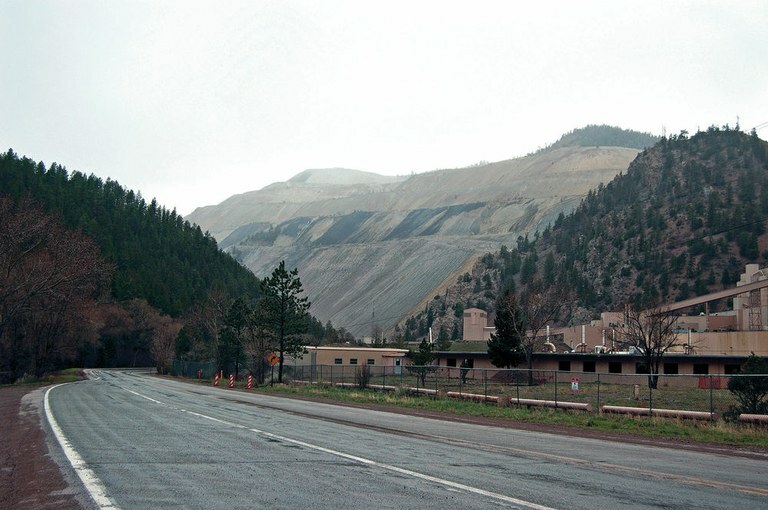 Chevron’s former molybdenum mine, pictured here, closed permanently in 2014. The outcomes are clearly changing economic, family and community dynamics across the region and the state. In the West, for instance, most rural counties lost young people in their 20s over the past few decades, and rural counties on average lost school-aged children because of families moving away. What’s not so clear is how to respond, or why. Do all small towns need to keep up? Cities, it seems, are inevitable. Economies of scale make it difficult to maintain the essentials of living in rural places. For most of human history, transportation and information exchange have been arduous, time-consuming and expensive; even the Pony Express operated at a loss. The idea that everything is more efficient, and therefore cheaper, when done in bulk has helped encourage cities’ growth, said Geoffrey West, a theoretical physicist with the Santa Fe Institute. West is researching the relationship between economies of scale, growth and long-term sustainability. It makes sense, he said, that cities are powerful economic engines. That historical rural-urban divide takes on a new meaning today, as only about 20 percent of the country’s population lives in rural places, compared to 60 percent in 1900. Still, the same technology that decimated some traditional ways of living in rural places may open doors that didn’t exist in the past. “Modern information technology has reduced the relevance of distance a great deal,” said Don Albrecht, the executive director of the Western Rural Development Center at Utah State University and the author of Rethinking Rural, a book on Western economic development. Technology, like telecommuting, could benefit rural communities if they take advantage of it, Albrecht said, and towns will survive if they can find a niche or connect to the rest of the urban economy. Telecommuting could help replace jobs lost to mechanization, as food and energy production has become increasingly efficient. But some experts say it’s likely that some small communities will effectively dissolve, their decline driven by population loss either over time or triggered by a single, disruptive event. Why might small towns survive? Green fields cover the sloping hills throughout Mora County, a community of 4,500 tucked high in the northern New Mexico hills between Las Vegas and Taos. Though this mostly Hispanic agricultural community has lost 13 percent of its population since 2000, it bucks one trend that other rural communities haven’t managed to shake. This county — and New Mexico overall — has actually added jobs in farming since 1970, despite the rest of the country shedding farming jobs during that time, according to research by the Bozeman-based economic research firm Headwaters Economics. In 1970, the U.S. Department of Commerce recorded 249 farm jobs in Mora County. In 2000, that number was 522. Mora illustrates one of the arguments for how rural communities could go on existing. Simply put, the argument goes like this: this country will always need food and energy. As long as rural places supply the land where food grows and energy is produced, communities will need to exist to support the people working there. In other words, even if some agricultural or energy communities shrink, they can’t all go away. Mora, once a community that produced wheat and flour to sell and trade with travelers on the historic Santa Fe Trail as well as a nearby military outpost, has capitalized on modern markets for local and organic food. A new cooperative farming organization, which got off the ground with help from the county’s first economic development committee in recent years, built greenhouses to extend the local growing season, sells produce to grocery stores in the region and now hosts workshops on how to launch eco-tourism businesses. 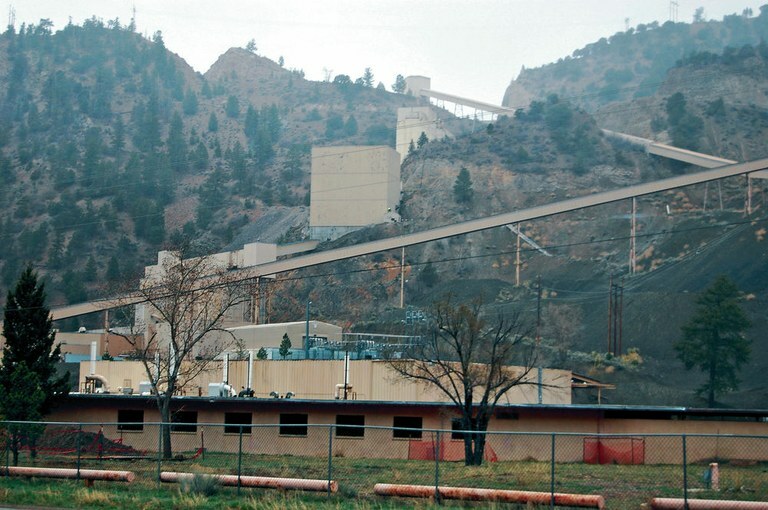 Chevron closed its molybdenum mine outside Questa in 2014. 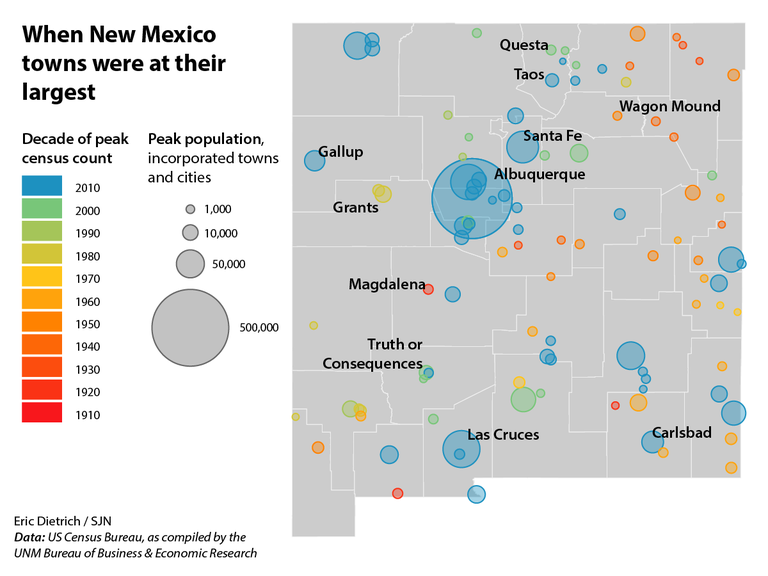 Since 2010, Questa has lost 20 percent of its population. Another line of thinking hinges on small towns being able to create a different kind of product people will pay for: tourism. As long as people — whether they come from rural places or urban — seek beautiful places and outdoor experiences, there will be a need for an industry to support their lifestyle. Mora is banking on this possibility, too. Olivas, for instance, operates one of several guiding companies in the county. Among the class of researchers, rural advocates and politicians studying the decline of rural places, there’s a tendency to offer a cultural reason for why small towns are worth saving, arguing that rural life is a unique chapter in our country’s history, and should be somehow preserved. But that cultural rationale is undermined by what seems to be a bigger, more threatening economic reality. Preservation is not an economic driver, said Weber, the Oregon State University professor, and almost certainly not on par with the jobs mining or farming once created. There’s another argument at play, and one that’s especially relevant to New Mexico, where 23 tribes make up more than 10 percent of the state’s population. For tribal nations, preserving the land and people who live off the land is not just about nostalgia. The rural communities on and around ancestral, treaty or reservation lands are central to these nations’ sovereignty. A history of federal incentives to move Native American residents to cities has contributed to a rural-urban divide among Indigenous people, said Laura Harris, executive director of the Albuquerque-based Americans for Indian Opportunity. Despite federal assistance to tribes mostly funneling to reservations, nearly 80 percent of all enrolled tribal people in the U.S. live in cities, she said. For Harris, sustaining ties to rural places is an integral part of sustaining tribes themselves. Do we owe anything to rural communities, which have powered and fed the country since the U.S. began? Some have gone so far as to suggest that, since the government in effect made life possible in some of these towns, that the government owes those communities a responsible exit plan. Major settlement didn’t occur in Truth or Consequences, a town of 6,000 people and several popular hot spring resorts off Interstate 25, until the federal Reclamation Act of 1902 authorized massive irrigation, which drew hundreds of construction workers needed to build a major dam. Rural electrification efforts in the New Deal era were marketed as a way to give rural Americans “a fair chance,” encouraging more people to stay in the countryside. Farming, a sometimes volatile industry where earnings can rise and fall dramatically year-to-year, has long been federally subsidized. But do all rural places need to keep up? Should communities aspire to be more than havens for quality of life refugees, so stressed city dwellers can take a soak in Truth or Consequences’ hot springs, or buy a cheap second home outside Questa? Does it matter whether Questa shrinks back to what it was before Chevron opened its mine? Or if a new generation doesn’t carry on Mora’s centuries-old agricultural tradition? The answers are never easy; tourists can change the character of a town and second-homers undoubtedly squeeze out the long-term rental market, just as job and wage growth eventually raises prices for everyone else.